For high speed printing processes, the limiting factor on productivity of the equipment is usually ink drying time. With non-contact monitoring of the inked surface temperature, press production can be maximized while assuring top quality. The surface temperature of freshly inked paper will be considerably cooler than ambient air temperature, and will rise very slowly as the paper absorbs heat. This occurs because the ink solvent absorbs much of the heat energy as it evaporates. At the point that the product becomes “dry,” however, the same constant heat supply will quickly raise the temperature until it reaches the same as the surrounding air, or higher if the heat source is radiation. 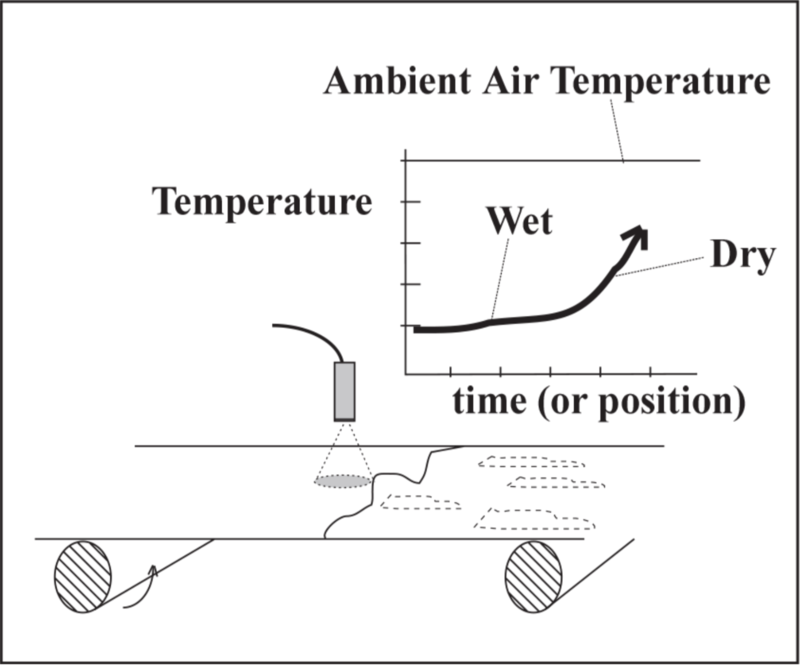 If temperature vs. time is plotted for a heated drying process, the target “dry” temperature point can clearly be seen as the beginning of a rapid rise in surface temperature. The IRt/c’s can be used to monitor these changes in surface temperature. With their fast response time, the IRt/c’s can quickly detect when the surface temperature begins to rise rapidly, an indication that the ink has dried, thus allowing press speeds to be maximized. Since all IRt/c’s are rated intrinsically safe (see Tech Note # 10), and are hermetically sealed to meet or exceed all applicable NEMA ratings, they can be used in hazardous environments with alcohol-based and other volatile inks. For tight areas, the IRt/c.SV or IRt/c.3SV is recommended.